Shambling barely perceptibly up the street, the itinerant starts to make casual contact with the locals. An unassuming request for help here, a tall tale there, imparting information and soaking it up at the same time. Yet as soon as he appears he soon vanishes, disappearing in mid-conversation and leaving only the vaguest notion of his presence in the first place. For Jim Pooley and John Omally, two layabouts who are more or less part of the Swan’s furniture, the vagrant’s comings and goings assume a sinister and they find themselves naturally compelled to investigate – for who knows, perhaps their efforts may yield fame or fortune? Before they know it they find themselves wrapped up in series of adventures and misadventures quite beyond their booze-addled comprehension. Aided by the local professor, a reclusive genius (also skilled in the ancient martial arts of Dimac), they uncover the secret of the magic beans, reveal a growing army of miniature demons and stumble upon a plot to turn Brentford into a new Vatican, hatched by none other than a malevolent reincarnation of Pope Alexander IV, last of the infamous Borgias. Around this shell is wrapped a tale which is irresistible in its lunacy and yet which, thanks to the grounding in its characters and locale, almost manages to pass as a description of normal life in Brentford. Encompassing everything from demons to zombies, from kung-fu adepts to satanic midnight masses, there’s no let-up in the action from start to finish. The build-up to and execution of the cowboy party scene in the Swan is absolutely beautiful, a crescendo of every brand of craziness known to man, encompassing page 3 girls, and army of Lone Rangers and a neon-lit (and poorly grounded) king of the open plains. No description can do this section justice, just go and read it right now. Finally, no review of The Antipope would be complete without a mention of the alcohol. To my recollection I have never seen, heard or read of such Herculean acts of consumption. Hunter Thompson doesn’t get a look in while Withnail and I look on in goggle-eyed awe. It seems that every single act committed by the denizens of Brentford must be accompanied by a bottle or two of Scotch if it’s to stand any chance of success. In fact, such is the constancy of the liquor’s flow that I can’t even recall mention of a single hangover – the effects are never given a chance to wear off before they are refreshed. Perhaps a re-read and an actual bottle count is in order. 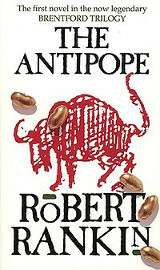 By virtue of Robert Rankin’s aptitude for genre-hopping would feel at home on a diverse range of bookshelves. Classified by the author himself as ‘far-fetched fiction’, there’s an appeal to those of a fantastical, science-fictional or horrific bent as well as those who simply fancy a taste of pre-Information Age England. The locale and literary style are firmly fixed but the humour is universal, making this one for lovers of a well-spun yarn anywhere.